While we may not all be on the road to becoming the next Master Chef, this time of year keeps us busy in the kitchen. During the coming holiday season, it’s the kitchen that becomes the cornerstone of your home. It’s where you’ll whip up spooky treats for Halloween. The place where you’ll spend hours preparing a delectable Thanksgiving fest. It’s also the room where you and your family will bake your delicious holiday cookies. As much time as you spend in the kitchen, functionality is one of the most important things to keep in mind when buying your new home. 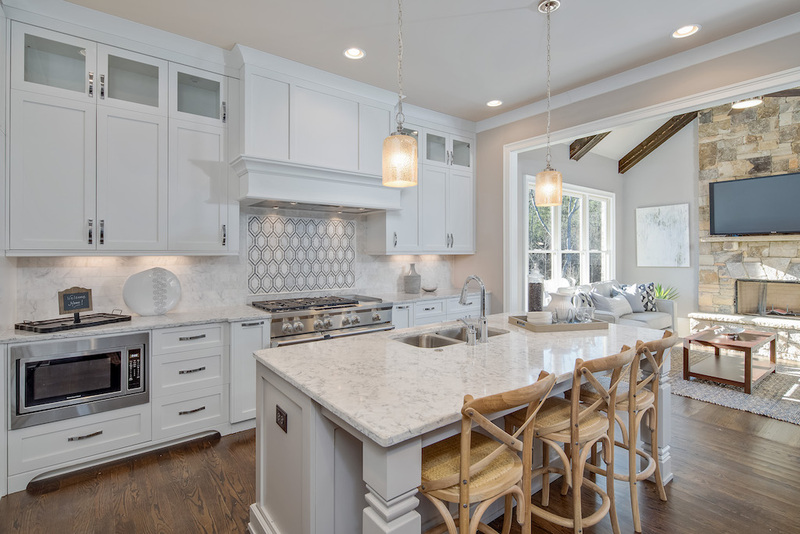 With that in mind, here are 4 kitchen design trends for your inner chef. We know what you’re thinking — adequate lighting is obvious. However, we’re talking about more than making sure you have a couple of lights in your kitchen design. Today’s kitchens are embracing brilliant lighting to not only set the aesthetic but also to ensure each kitchen is well lit. 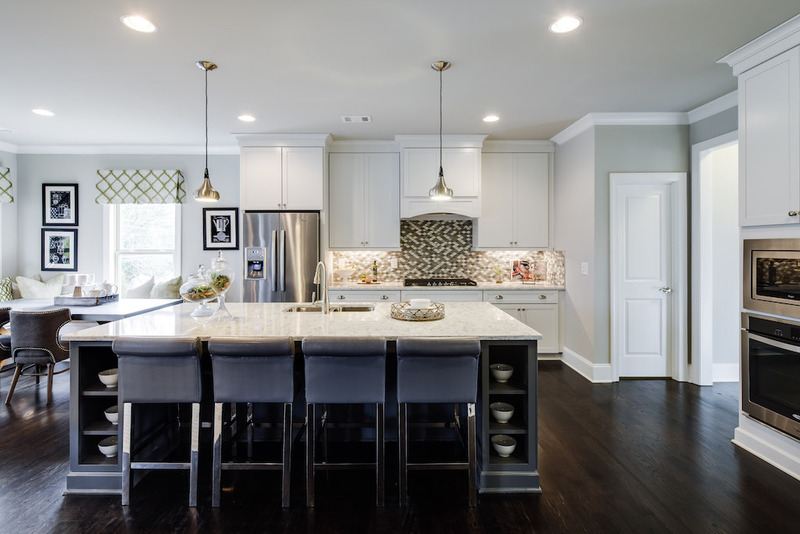 This includes everything from recessed lighting to suspended pendants and under cabinet lighting. A combination of each form of lighting, as seen in our kitchen from Cosmopolitan above, will make every inch of your kitchen well-lit so you can utilize every cooking surface in your kitchen. Gone are the days of bland kitchens. This year, it’s all about spicing things up with bold accents, including the backsplash. From vibrant colors to subway tiles and eye-catching geometric shapes, there are countless ways to add a dash of fun to your kitchen. 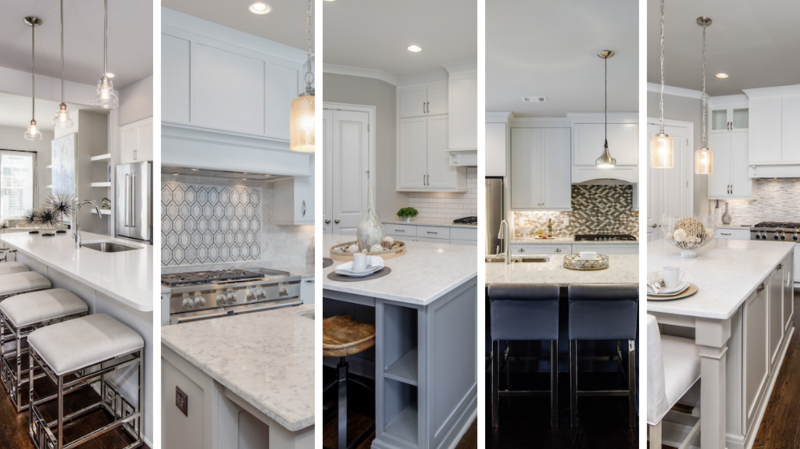 Like seen in the kitchen above from Citadella, we display different styles of backsplash in our homes and townhomes throughout Atlanta. Another visual element that can enhance the appeal of your kitchen when guests are over during the holidays is contrasting cabinetry. 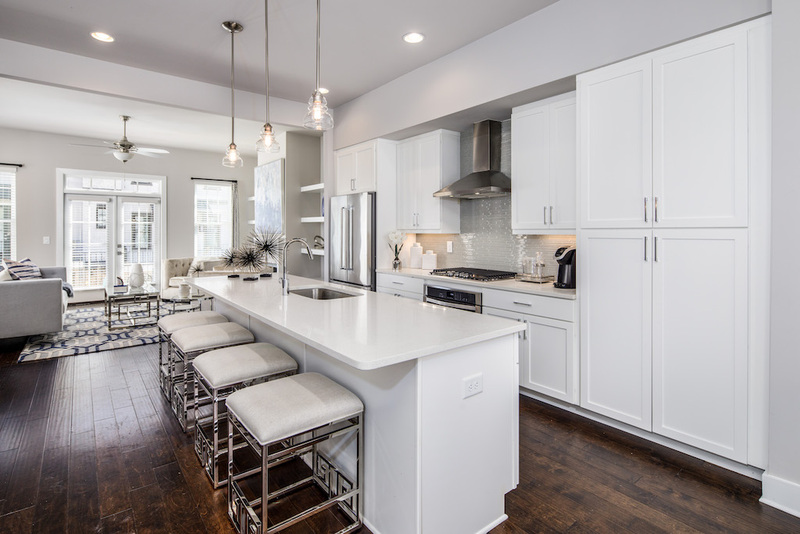 As seen in the kitchen above from Long Island Parc, a subtle yet strategic choice can help bring your kitchen to life. What’s unique about this trend is there are a variety of ways to incorporate it into your kitchen. 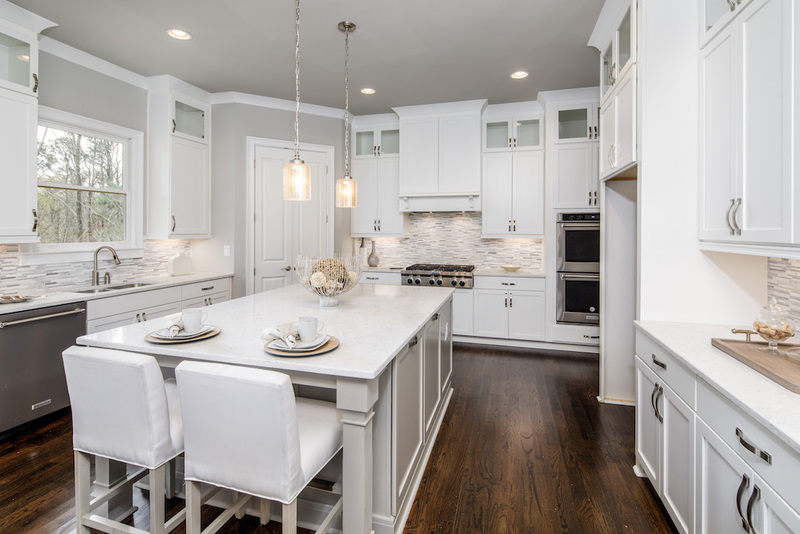 Along with contrasting your cabinetry with the color of your island, you can also choose to contrast it with the color of your wall or backsplash. Kitchen islands are the perfect functional surface for every kitchen. This is especially true when you have room for an oversized island. Most notably, it provides an extended surface for food prep. An oversized island also gives you more space for seating. It can be the place where your family enjoys breakfast before school and decorating your holiday cookies together. 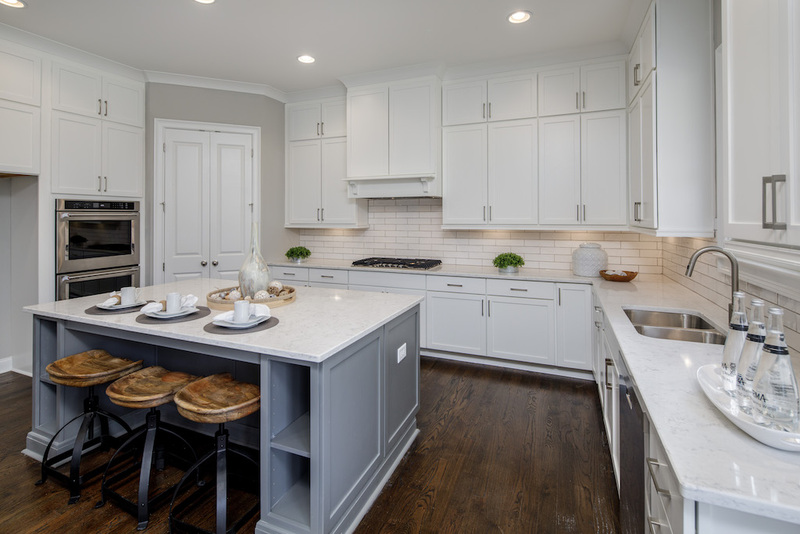 Lastly, if your island includes shelves and cabinetry like our kitchen above at Park Chase, it can provide an extra storage space for your cookware. Embrace your inner chef this holiday season by finding the Rockhaven kitchen design that suits your lifestyle. Need some inspiration? Take a look at the homes in our gallery. Once you’ve found the look you want, find the Rockhaven Homes community that’s right for you. Then contact us so we can help you take the next steps towards your new home.